Rev. 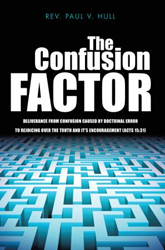 Paul V. Hull’s new book, The Confusion Factor, ($16.49, paperback, 9781629524788; $8.99, e-book, 9781629524795) was written from his extraordinary forty years of Pastoral ministry. He brings clarity to many areas of doctrinal confusion thus setting believers free to mature, live Godly Christian lives and witness to others with the joy that comes from knowing who they are in Christ, all they have in Christ, all He is IN them, and their security in Christ and in God's love. In this book, Rev. Paul V. Hull soundly defends the Gospel of the Grace of God, of Free Grace. He explores doctrinal confusion about Eternal Salvation and Christian Living that is prevalent today. He is not pushing a new theology. Rather, he is pointing out ageless eternal truths. He provides over 2,500 Scripture references that support his teaching plus explanations of 100+ passages that are subject to confusion. Readers need to be prepared to study, think, be challenged, grow, and experience the joy of being set free by the Truth. This book is an excellent must-have resource for Bible Study. His openness and willingness to share his personal accounts – that are artless, achingly honest and moving – makes this a book to experience, not just to read. In 1961 Pastor Paul and his wife Suzy were introduced to and placed their faith in the Lord Jesus Christ as Savior. After a few years God led them to enter training with Wycliffe Bible Translators as support workers. This included The Summer Institute of Linguistics at the University of Oklahoma and three months of training at Jungle Camp in the Southern Mexican jungle along with their three children. They traveled the U.S. for over a year to raise Prayer and Financial support and eventually were assigned to Sierra Leone, West Africa with Lutheran Bible Translators. While on the field, Paul received his call to Pastoral Ministry. He and the family came home and were led to a Bible School in New Hampshire, White Mountains Seminary where he studied and trained and was ordained. He began his first pastorate in 1976 in Julian, California. He has served Churches (planting two) for over forty years. He holds Ordination in both the Evangelical Free Church and The Christian and Missionary Alliance. His numerous positions and assignments have provided him with a wealth of Biblical, Pastoral, and ministry knowledge from which to write this outstanding book. Xulon Press, a division of Salem Media Group, is the world’s largest Christian self-publisher, with more than 15,000 titles published to date. Retailers may order The Confusion Factor through Ingram Book Company and/or Spring Arbor Book Distributors. The book is available online through xulonpress.com/bookstore, amazon.com, and barnesandnoble.com.